ReGen Powertech is committed to providing an alternate source of energy that is clean, green and sustainable. 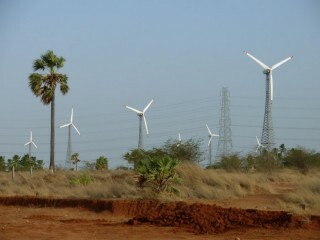 ReGen is the fastest growing Wind Energy Company in India in just 7 years of commissioning its state of the art manufacturing facility at Tada, Andhra Pradesh. ReGen is making a huge contribution to meet India’s electricity demand with largest market share in the Independent Power Producers sector and it is uniquely positioned to capitalize on the growing demand for wind power energy in India and other geographies. ReGen has grown many folds over the last five years and outperformed new entrants while gaining market share from established players. ReGen is promoted by highly experienced entrepreneurs in the wind energy industry. A team of around 2000 professionals with over 4000 years of experience in wind and other relevant industries spearhead the operations of various verticals within the organisation. ReGen has emerged as the largest player with the cumulative Installed capacity exceeding 1.8 GW as on Oct. 2015 which includes 45 MW in Sri Lanka. ReGen’s growth over the last five years is over 100% CAGR. ReGen has emerged as one of the most preferred turbine manufacturers across all customer groups and especially by Independent Power Producers (IPPs), thanks to the superior technology and reliable turbines, timely delivery, excellent after sales support and in-house team specialising in wind resource assessment. ReGen boasts of an impressive clientele and high frequency of repeat orders from esteemed investors like Tata Power, Green Infra, ReNew Power, NSL Power, NuPower Renewables, Hero Group, Mytrah Energy, Greenko, ITC Group, Premier Mills, TVS Energy, GAIL, Hetero Wind, Bhilwara Energy, Orange Power, Malpani Group, Jindal Steel and Power, Godhawat Group, Yogesh Agency (ATG Tyre) and Ghari Detergent. ReGen has a strong track record of installations and solid project pipeline with over 500 MW scheduled for commissioning during the current financial year.